Daddy’s Fluffy Vegan Pancakes – Happy. Homeschooling. Housewife. In our house Saturday mornings mean one thing, pancakes! After a week of oatmeal breakfasts (we love our oatmeal but do enjoy a break) we all look forward to a hot stack of fluffy pancakes. On a usual morning we would have opened our trusty Aunt Jemima Complete pancake mix. But ever since we have started eating clean (we are newbies and have found this website very helpful) we have had to make our pancake batter from scratch. And this job, searching and making homemade pancakes, most always falls into my lap. Last night I pleaded with hubby to make the pancakes, I wanted to sleep in a little and wake up to the warm smell of cooking batter, yum! Khari isn’t the biggest fan of homemade pancake batter, but today I think has changed his mind. He found a great vegan recipe and then made some tweaks to it (mainly because he was too lazy –he self admits–to find the ingredients) and the result? The most delicious pancakes…moist, fluffy and full of a surprising flavor, applesauce. 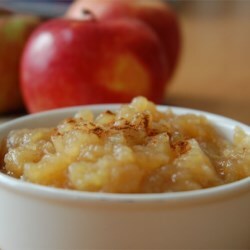 The applesauce adds such a depth of comfort and sweetness to the pancakes. Good bye Aunt Jemima…Hello Daddy Cakes! Khari really suggest reading the recipe and all the tips (especially the not over mixing tip) recipe creator, Andrew Olson provides. Below is Khari’s recipe that is inspired by vegan chef Olson and it makes about 20 4-5 inch cakes! In a medium mixing bowl, add the dry ingredients (flour, sugar, baking powder, baking soda, salt) and stir together. In a separate bowl, add the non-dairy milk and apple cider vinegar to create buttermilk. Then add one tablespoon melted coconut oil and finally the applesauce. Mix the wet ingredients. Now, carefully mix the two together without stressing the batter. 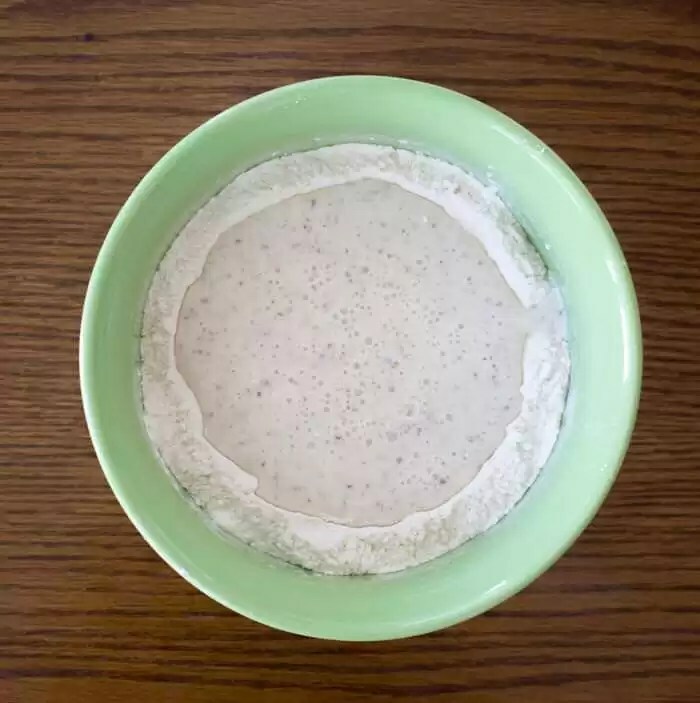 To do this, form a “crater” in the middle of the dry ingredients, then pour the wet ingredients (as shown) into the crater.Slowly stir until most of the batter is incorporated. A few small lumps are your friend, too much mixing is not. Andrew Olson’s picture of the crater. Pour the wet ingredients into the center of the dry ingredients. Warm the pan over medium-high heat for 3-5 minutes. Then, use a paper towel to spread a little vegetable oil over the bottom of the pan. Test the temperature by cooking one small pancake first. If it sizzles when it hits the pan and forms bubbles after 1-2 minutes without burning, your temperatures are right. Use a 1/4 cup measurement to create the perfect 4-inch pancakes. If your pan is large enough, you can cook 2-3 at a time. Again, wait 2 minutes for large bubbles to form on the surface, then flip and cook for another 90 seconds. Store the first batches in a warm oven while you finish the rest. We enjoyed our pancakes with fresh blueberries, raspberries and walnuts. You top them with whatever suits your fancy! I love a good stack of pancakes at any time during the day. When I sat down to breakfast Saturday morning with the family for our usual Saturday morning pancake breakfast, I can truly say we were all blessed with the aroma, presentation, and most of all the taste of Khari’s pancakes…IHOP can’t touch that!!! Chantel now have Saturday mornings off.